Some of the most common causes of blindness in the world are caused by diseases that are rooted in human DNA. Unlike injuries or infections, these disorders, like macular degeneration and glaucoma, are triggered by flaws in human DNA. Very little can be done to prevent, or even cure these problems, but new methods are in development. 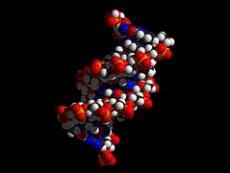 Genetic therapy is a means by which the DNA in the affected cells in rewritten. By replacing the errant genetic code with more functional elements, the diseases caused by the problem genes can hopefully be prevented or reversed. One of the major issues with gene therapy, however, is implementation. The DNA within the human body is incredibly small, and needs to be introduced to billions of cells. The most successful method to date is an injection directly into the eye. New research published in ACS Applies Materials & Interfaces has shown success is using eye drops to administer this therapy. Even degenerative conditions, like proliferative diabetic retinopathy and age-related macular degeneration, which occur in the tissues near the back of the eye, can be treated with this method. What many of these diseases have in common is their effect on the blood vessels within the eye that deteriorate or become restricted, preventing the necessary nutrients from reaching the eye tissues that need them. By targeting the genes responsible for the growth of these blood vessels patients potentially have a means of fighting back against the issues caused by their own DNA.